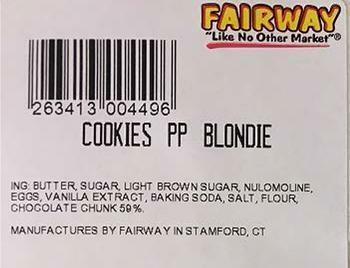 Fairway Market of New York, N.Y., is recalling Fairway brand Cookies Blondie that may contain walnuts, an allergen not declared on the label. The recalled product is packaged in octagon-shaped plastic containers that are black on the bottom and clear on the top with a standard weight of 10-oz bearing either Item Code 268492 XXXXXX or 263413 XXXXXX. All ‘‘SELL BY’’ Date codes are being recalled. They were distributed to Fairway stores in New York, New Jersey and Connecticut and also through home delivery programs provided by Fairway E-commerce, Google and Instacart. Consumers with questions may contact the company at (646)616-8265, Monday Friday, 9 am 5 pm (EST).